With peaches and grilling being in season I had an urge to combine both into a new summer cocktail. I love peaches with rum so that's the road I went down. I wanted to use my Diplomático Reserva Rum in the drink so I thought I'd also marinate and glaze the fresh peaches with some rum as well. Who doesn't like a double dose of rum? But I wasn't wasting any of the Diplomático in a marinade that would grill off so I used my stock dark rum in the marinade. If you have unlimited supply of Diplomático Reserva, by all means add it to the peaches too. And call me, I'd like to be friends with anyone with an unlimited supply of Diplomático Reserva Rum! Mix the ingredients together then add the peaches and allow to marinate for a minimum of an hour. When your grill is ready place the peaches flesh side down and grill for 3 - 8 minutes. The time will depend on how hot your grill is and how close the peaches are to the heat. Stay on top of them and check for nice grill marks and caramelization every minute. Flip your peaches over, brush with marinade and continue to grill and baste for another few minutes. Be careful, rum is flammable! 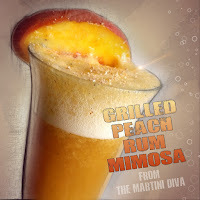 When the peaches are tender remove from the grill, cool then set aside until you're ready to mix your drinks. If you're using these as dessert, you don't have to peel the peaches. Because I was going to be using them as a cocktail puree I did. Chill your glass(es) in the freezer. 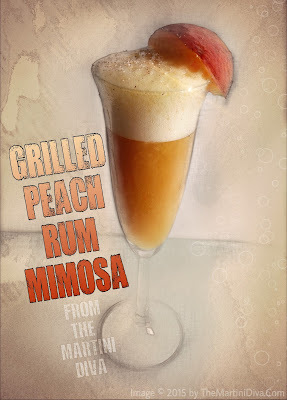 Add the rum, peach puree, honey, orange bitters and egg white to your blender and blend until smooth. Transfer this cocktail to an ice filled shaker and shake vigorously for 30 seconds, watch for your shaker to frost over. Pour 2 ounces of your mimosa style into each chilled Champagne goblet. SLOWLY top off with the Champagne, being careful not to overfill because the bubbly and the egg will create a foam which can overflow. Garnish with a fresh peach slice. Dust with a teeny bit of nutmeg and enjoy!